Sushi sandwiches - my favorites way to stuff a bunch of goodies into a ball of sushi rice and wrap it tightly in nori for easy transportation to the beach. Cardamom Spiced Cookies & Matcha Whipped Cream. Blueberry Maple Swirled Chia Pops. 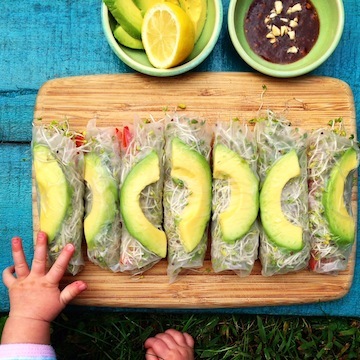 Fresh, vibrant, flavors in my favorite snack for the beach: summer rolls.